This is a die-cut Ben-Hur Coffee porcelain sign. 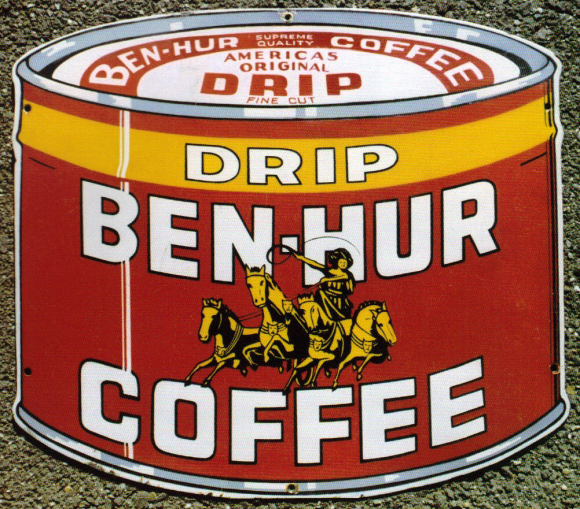 This particular Ben-Hur Coffee sign is in the shape of a coffee can. It reads, “Ben-Hur Coffee, Supreme Quality, America’s Original Drip, Fine Cut, Drip Ben-Hur Coffee” and features a yellow team of horses with a rider on a red background with white text.